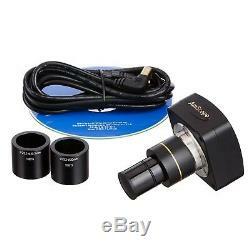 AmScope 3.5X-90X Jewelry Gem Stereo Microscope + Dual Halogen + 3MP USB Camera. 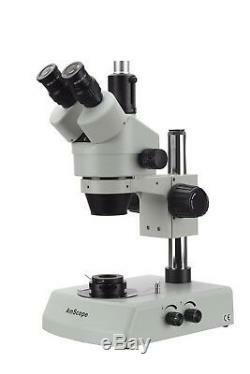 3.5X-90X continuous zoom stereo jewelry gem microscope. Super widefield bright and dark field optical system with iris. 2-1/2" Super widefield of view and 8" working distance. Heavy-duty sturdy pillar stand with metal framework. 3MP digital camera with advanced editing & measuring software for Windows XP/Vista/7/8/10. 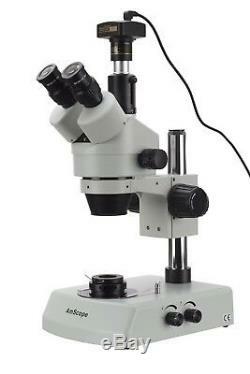 This first-class 3.5X-90X trinocular jewelry/gem stereo zoom microscope incorporates all the most excellent features of a high quality laboratory instrument. 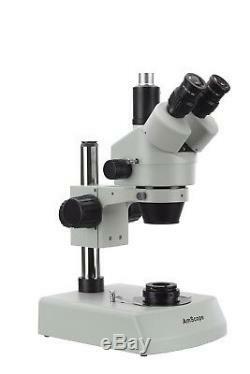 Designed to meet the demands of modern gemology microscopy, this microscope exceeds all expectations. It provides super widefield optics and comes with a gem clamp and darkfield condenser with iris diaphragm. 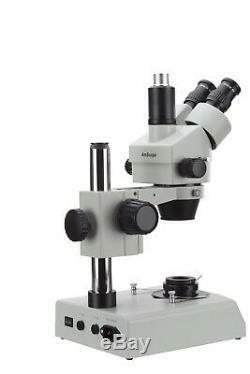 This microscope offers high resolution and good depth within a broad field of view. With super widefield optics, it gives crystal clear images. 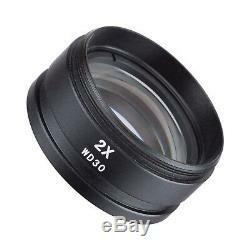 It provides 2-1/2" (65mm) super widefield, 26:1 large zoom range and 8" (200mm) long working distance. The 45 degree inclined binocular and high-eyepoint design ensures an easy observation for all users including eyeglass wearers. The versatile illumination system with the microscope provides both incident (top) lighting and transmitted (bottom) lighting. The top lighting shining down onto objects is used for the observation of surface details and fine structures of jewels or gemstones. 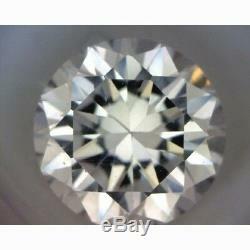 The transmitted illumination through the condenser is for the examination of inside quality of diamonds. 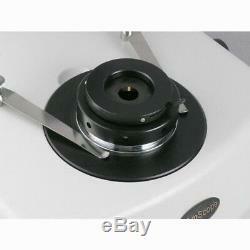 This microscope is an ideal instrument for gemologists, jewelry dealers and collectors. The 3MP USB2.0 digital camera captures still images and video, and allows you to view a live stream on your PC. With software available for Windows, Mac, and Linux, it's a multi-platform imaging solution. The included Windows software offers image-development and measurement tools, as well as advanced compositing features such as image-stitching and extended-depth-of-focus. Independent preview and capture resolutions allow you to view high-speed video while capturing high-definition images. For Mac and Linux, there is a lite version with limited processing features. A great jewelry/gem stereo microscope. A brightfield and darkfield microscopy system for jewelry/gem applications. Darkfield condenser with iris included. 3.5X-90X large zoom range continuous magnification. 26:1 extremely large zoom range. 8 (200mm) large working distance. 45 degree inclined trinocular head with SUPER widefield eyepieces. High-eyepoint design for easy observation for all users including eyeglass wearers. 23mm upright tube for photo or video accessories. 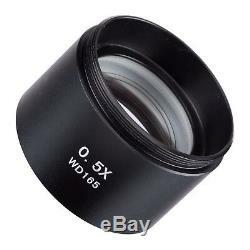 30mm SUPER widefield eyepieces included. High resolution with great flatness and contrast. Sharp stereo erect images over a SUPER widefield of view. Crystal clear original true color images. Both ocular-tubes with adjustable diopter. Metal pillar stand finished with stain resistant enamel. Accurate alignment ensuring a fatigue-free long time viewing. Built-in Epi-illuminating and transmitted lighting system with adjustable intensity. Manufactured under restrict ISO 9001 quality control system. Head: 45 degree inclined 360 degree swiveling trinocular. Eyepiece: 30mm super wide field high-eyepoint WF10X/20. Barlow Lenses: 0.5X and 2.0X. Interpupillary Distance: 2-3/16" - 2-15/16" (55-75mm). Maximum Field of View: 2-1/2 (63.5mm). Minimum Field of View: 3/16 (4.76mm). Frosted Glass Plate: 3-3/4 (95mm) in diameter. White/Black Plastic Plate: 3-3/4 (95mm) in diameter. Incident (Top) Illumination: 12V/15W halogen bulb. Transmitted (Bottom) Illumination: 12V/15W halogen bulb. Power Supply: 110V/60Hz (220V/50Hz version available). Accessories: dust cover, eye-guards and clips. Sensor Size: 6.55x4.92mm. Compatibility: Windows (32/64 bit) XP/Vista/7/8/10, Mac OSX, Linux. OS Requirements: Windows (32/64 bit) XP/Vista/7/8/10, Mac OS 10.8+, Linux kernel 3.13+. Hardware Requirements: Intel Core2 2.8GHz or comparable processor, 2GB RAM, USB2.0 port. One Trinocular Stereo Zoom Head. One Pair of High-Eyepoint 10X Eyepieces. One 0.5X Barlow Lens. One Pillar Base with Bottom Light. One Frosted Round Glass Plate. One White/Black Round Working Plate. One 3MP USB2.0 Digital Camera with a reduction lense. Two sizing adapters (23-30mm, 23-30.5mm). Our goal is to assist great minds in reaching that "Eureka" moment. Our promise: When you use AmScope, you'll see things bigger! 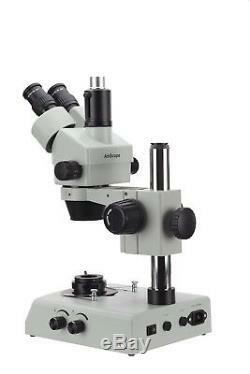 The item "AmScope 3.5X-90X Jewelry Gem Stereo Microscope + Dual Halogen + 3MP USB Camera" is in sale since Tuesday, March 5, 2013. 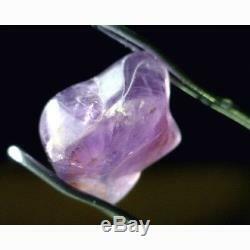 This item is in the category "Business & Industrial\Healthcare, Lab & Dental\Medical & Lab Equipment, Devices\Microscopes". 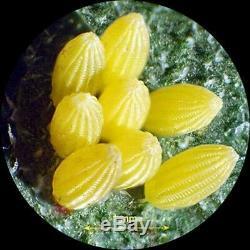 The seller is "amscope" and is located in Irvine, California.